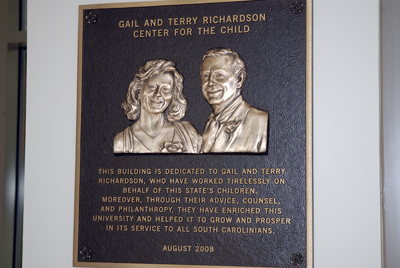 The center bears the names of two individuals, Gail and Terry Richardson of Barnwell, who have been long-time supporters of Francis Marion University and enthusiastic proponents for establishing the Center for the Child. Not only are Gail and Terry Richardson substantial donors to FMU, but they also have been very active in university life for many years. This is a fitting tribute to their loyalty to FMU and their devotion to children. Gail Ness Richardson has served on the FMU Board of Trustees since 1988 and was the first woman elected to a two-year term as chair in 2003. She earned a bachelor’s degree from Queens College in Charlotte and a master’s in library science from the University of South Carolina. She has been a public school teacher and a community advocate for education. Terry E. Richardson, Jr. is a successful attorney with the law firm Richardson, Patrick, Westbrook & Brickman in Barnwell. 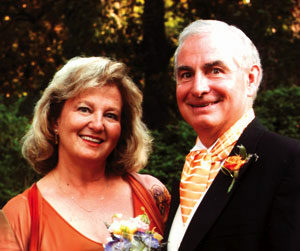 He earned a bachelor’s and master’s degree at Clemson University and a law degree at the University of South Carolina. He received the President’s Award for Service from the S.C. Trial Lawyers Association in 1994, and the Compleat Lawyer Award from the S.C. Bar in 2003. Research in the past decade has identified numerous intervention and prevention strategies to enhance the potential of young children. The purpose of this center will be to put these strategies into widespread practice, especially among those individuals and agencies that have the greatest opportunity to affect the lives of children. An endowment has been established to ensure long-term resources for the work of the Center for the Child. Contributions to endowments are an excellent way to show support. The endowment’s principle remains secure in perpetuity with a portion of the earning being returned to the fund each year to continue its growth while the remainder serves the needs of the Center. In addition, there will be naming opportunities for individuals, corporations or businesses for various areas within the Center. Details are available through the Francis Marion University Foundation. The Francis Marion University Foundation, and its Board of Directors, asks you to be an integral part of this endeavor. Opportunities to assist with this project exist on multiple levels. Learn how you or your organization can become an active partner in this undertaking today.